568 pages | 98 B/W Illus. Twenty years after its first publication, Corrosion Science and Technology continues to be a relevant practical guide for students and professionals interested in material science. 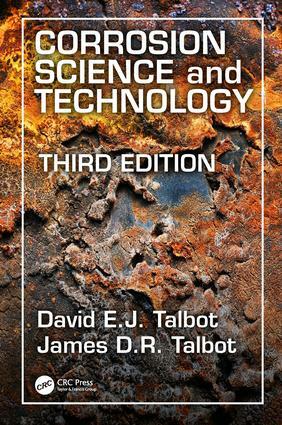 This Third Edition thoroughly covers the basic principles of corrosion science in the same reader-friendly manner that made the previous editioninvaluable, and enlarges the scope of the content with expanded chapters on processes for various metals and new technologies for limiting costs and metal degradation in a variety of commercial enterprises not explored in previous editions. This book also presents expertly developed methods of corrosion testing and prediction. "…a great book for corrosion science, suitable for both (graduate) students and professionals. The selection of topics is comprehensive, and subjects are presented with a remarkable depth of analysis. The authors explain the subject matter clearly and concisely, making this work a valuable option as a textbook. In addition, this book provides several examples of real-world examples, thereby helping the reader to translate the theoretical and fundamental concepts to corrosion problems and solutions in day-to-day scientific and engineering applications." 20.2 Buried Pipelines and Distribution Systems. David Talbot graduated with a B.Sc and an M.Sc. from the University of Wales and a Ph.D. from Brunel University for research on gas-metal equilibria. From 1949 to 1966, he was employed at the research laboratories of the British Aluminium Company Ltd., contributing to research promoting the development of manufacturing processes and to customer service. From 1966 to 1994, he taught courses on corrosion and other aspects of chemical metallurgy at Brunel University and maintained an active interest in research and development, mainly in collaboration with manufacturing industries in the United Kingdom and the United States. He was a member of the Institute of Materials and had chartered engineer status; he served as a member of the council of the London Metallurgical Society. Dr. Talbot wrote many papers on chemical aspects of metallurgy, a review on metal-hydrogen systems in International Metallurgical Reviews, and a section on gas-metal systems in Smithells Reference Book. James Talbot graduated with a B.Sc. ARCS, from Imperial College, London, and received his M.Sc. from Brunel University. He received his Ph.D. from the University of Reading for research on the physical chemistry of aqueous solutions and its application to natural waters. Dr. Talbot worked at the River Laboratory of the Institute of Freshwater Ecology, Dorset, United Kingdom, where he assessed and predicted physical chemical changes occurring in river management, He has written papers on the speciation of solutes in natural waters. From 2000 to 2006, he was a lecturer in materials research chemistry at Cranfield University in the United Kingdom, where he specialized in the physicochemical aspects of corrosion, polymer science, and process science. He is presently a chemist with interests in species specific corrosion mechanisms. Dr. Talbot is a current member of the Structure and Properties of Materials Committee of the Institute of Metals, Minerals and Mining. He has published in the fields of corrosion, polymer chemistry, solution chemistry, and the chemistry of natural waters.